At least Michael Ignatieff moved back here. You know what I mean, Mr. Disembark Tank. You’re just leaving. As expected. Likely as planned. During your (really) short jog through the colonies, you proved one thing, however. You showed us that running a leadership campaign out of a mansion in Boston is possible – in the Conservative Party of Canada. Not sure we Liberals or the New Democrats would ever go for it, however. Pretty sure we wouldn’t. And that, as you eyeball Gate 11 – the gate at Ottawa International Airport for most flights to Boston, your true home, God Bless America, etc. – is the problem, isn’t it? The problem wasn’t you, per se. The problem is the once-great Conservative Party of Canada. The notion that any serious political party would ever seriously consider you as a leader – well, it says it all, doesn’t it? The fact that the Conservative Party would ever rally behind a vulgarian who grabs women, mocks women, dismisses women – well, it’s kind of crazy, Kev. One who is — as the National Post’s Andrew Coyne called you — “a clown,” who never held political office and didn’t have a single coherent policy. One who didn’t speak French. One who called two black women “colourful cockroaches.” One who called an opponent “an Indian giver with a forked tongue.” One who said “it’s fantastic” that half the world’s population lives in poverty. One who said that unions “should be destroyed with evil,” whatever that means. One who said that anyone in a union should “be thrown in jail.” And on and on. You get the picture, Kev. You, like Donald Trump, seem to like to say whatever mean, rotten, cruel thing pops into your head. And you seem to equate headlines with support. But notoriety isn’t the same thing as popularity. That said, the Conservative Party fell for it, didn’t they? Hook, line and blinkered. So desperate are they to recapture relevance, so completely out of touch and out of ideas are they that they enveloped you in their warm, corporate embrace. They welcomed you into their cloistered confines. It was like Stephen Harper had never even happened. In no time at all, they propelled you to the front of the leadership line. Most of the leadership aspirants were the Dwarves but you were their Snow White. Every Tory wanted to be rescued by you. But we’ll give you this much, Kev. You were uncharacteristically candid when you withdrew from the race at one of those hastily called press conferences. You were honest. You had reflected, you said, and you and your advisers concluded you just couldn’t beat Justin Trudeau. And it’s true: you weren’t going to ever beat Trudeau. He was going to put you through the political Cuisinart. So you packed up your toothbrush, waved over your shoulder in the direction of Mad Max Bernier and started jogging back to Gate 11. 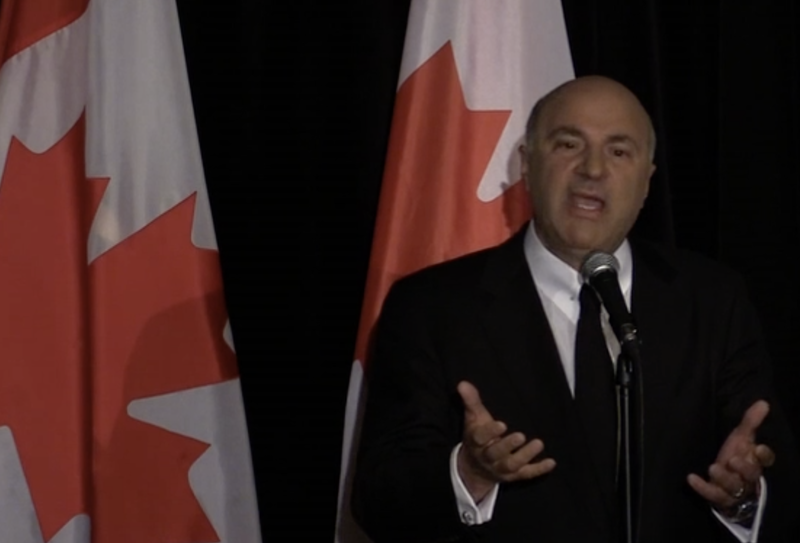 I am not sorry to see Kevin O’Leary out of the Conservative leadership contest, as I believe he assessed his chances of electoral victory correctly regarding Quebec. 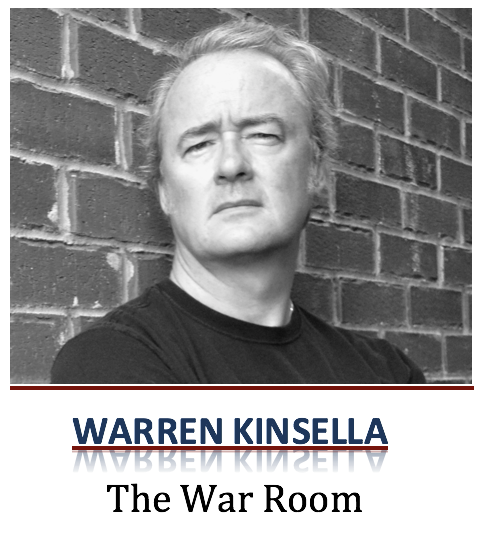 I do tire, however, of Warren Kinsella’s smug, sneering, “I have the moral high road and by the way I’m way smarter than-you” condescension at anything that smacks of common sense. This typifies the (self-described) Progressive elitist attitude toward average Canadians and Americans. You know the ones, your friends and neighbours, the salt-of-the-earth types that generate the actual wealth in our countries, that work in small business and private enterprise, pay their taxes, but have become tired of being told how they should think, act, vote, and having their hard-earned money confiscated by so-called Progressives to fund hare-brained government schemes and more government workers. Ontario has lost 347,000 manufacturing jobs while hiring 363,000 government workers since 2003. This does not make sense. All most folks want to do is feed their families, have a roof over their heads, put a little away for retirement, and take a vacation now and then, a few simple pleasures. They have been made to feel guilty for those things by the likes of Mr. KInsella. In his last column published here, he poked fun at a fellow he met while campaigning for Hillary Clinton in one of the New England states because he had committed the sin of having a beard and drove a pickup truck. A grave error for certain in Kinsella’s world. If he ever wonders why America elected Donald Trump, he need only look in the mirror, as the backlash of looking down your nose at Mainstreet USA was borne out in voting booths all across middle America. In some respects, and to a lesser degree than electing a Donald Trump, I hope it happens here too, and serves as a wake-up call that average Canadians are as tired as average Americans of guilt being downloaded onto them by The Enlightened.